The MLB offseason is upon us. There are many decisions that this front office will need to make. Some will happen soon. One big decision that is made every November is which players to add to the 40-man roster. Being added to the 40-man roster is a huge thing for players. They make a little more money in the minor leagues, but more important, a huge obstacle to being called up to the big leagues is removed. Here is a list of Twins minor leaguers who would be eligible for the Rule 5 draft if not protected. Players who signed when they were 18 or younger in 2014 (during the minor league season). Players who signed when they were 19 or older in 2015. Players who were eligible in previous seasons are also eligible again. Players drafted or signed during the 2012 season became free agents after the World Series was complete. That includes Luke Bard and DJ Baxendale. If the Twins signed them (or other minor league free agents) before the Rule 5 draft, they would be eligible to for the Rule 5 draft. But back to the players needing to be added or risk losing to the Rule 5 draft, I’ll break them into a few categories. The Givens are players that I think have to be added or there is a high percentage that they will be selected if they are not. The next are players that are more On The Bubble. It will be interesting to see which of these guys are added. How many spots are available on the team’s 40-man roster, etc. I’m going to add a couple of Sleepers. Finally, the Next category are those players that probably won’t be added and yet do have a chance to be selected by the right team with the right need or the right report. Andrew Vasquez would have been in this list, but he was called up to the Twins on September 1st. I have two players listed as givens. 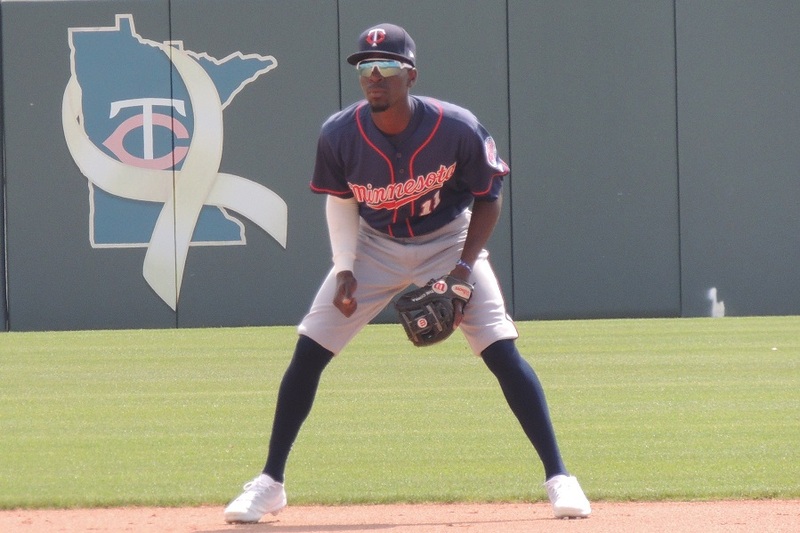 SS/2B Nick Gordon - He may have struggled in the second half of the season after his promotion to the Red Wings, but Gordon, the team’s top pick in 2014 just turned 23 and remains a quality prospect. Will he play second base or shortstop, or both, in the big leagues? Yes. OF LaMonte Wade - Wade will turn 25 on New Years Day. He returned to AA to start 2018 and hit the same number of home runs in less than half as many games. He hit .229 in Rochester and still got on base 33% of the time. The outfielder is close and for the right team, he could start in the big leagues now. Again, this group is the players on the bubble. Depending upon how many players the Twins add, a couple of these players could be added. 2B Luis Arraez - After missing most of 2017, Arraez returned to form with the Miracle in 2018 and ended the season with two months in Chattanooga. While not a high ranking prospect, the second baseman can hit single after single. RHP Jake Reed - If it was me, Reed would be a given, but he already didn’t get selected a year ago in the Rule 5 draft, and he didn’t get a September call up despite being tremendous over the final three months of the season. Now 26, he is ready for a big league opportunity. RHP Nick Anderson - As good as Reed was over the final three months, that’s how good Anderson was during the season’s first three months. Another inexplicable exclusion from the September roster adds, Anderson is absolutely ready for a big league opportunity, making him a strong Rule 5 candidate. LHP Tyler Jay - The Twins top pick in 2015 has endured a series of arm injuries which have cost him time and some of his stuff. Now a reliever, he still has a chance to be a big league contributor. Here are a couple of guys who might be brought up some places as possible . RHP Johan Quezada - Signed way back in September of 2012, Quezada only has four games pitched above the rookie leagues. He was very raw when he signed. He grew a ton, but then he struggled with shoulder issues for a couple of years. He returned this year and found an upper-90s fastball. He turned 24 late in the season and isn’t likely to stick, but he is a very intriguing arm. RHP Andro Cutura - Cutura returned in May after missing two years due to Tommy John surgery. The former seventh-round pick threw well for the Miracle in his return. Again, probably not so much a Rule 5 guy as one to watch in 2019. This is a group that contains some intriguing names. While they aren’t obvious choices, there could be a team that likes them enough to take a shot with a Rule 5 pick. 1B/OF Zander Wiel - Now playing first base and left field, Wiel had a really nice season in AA Chattanooga before a late-season promotion to Rochester. RHP Ryan Eades - The Twins second round pick in 2013, Eades continued to pitch in multiple roles. Not a starter, and not a late-inning guy, Eades could be intriguing for teams interested in using him as an Opener candidate. C Brian Navarreto - Navaretto is such a strong defensive catcher. If he can hit even a little bit, he could have a long big league career. He’s got the size, but he just hasn’t put up the numbers offensively. OF Jaylin Davis - Davis is playing well in the Arizona Fall League. He was able to cut down his K-rate and increase his walk rate in 2018. RHP Hector Lujan - Another AFL candidate, Lujan has slowly worked up the system and continued to add pieces to his game. He throws hard and has some intriguing secondary pitches. RHP Cody Stashak - Stashak moved to the bullpen in 2018 and really had a nice season. He too could be intriguing as teams look to use the Opener of bullpening strategies in coming years. Here is a list of other players who are eligible for the Rule 5 draft in the Twins organization. Now, the number of players added to the 40-man roster will in large part depend upon how many players that the front office is willing to remove from the 40-man roster over the next couple of weeks. In the comments below, discuss my ranking and rank them by how you would protect them. Again depends, I might try to trade a couple of the upper level players who would probably be lost for a couple of equal types who do not have to be protected. Arranz - he may be more ready than Gordon and could give us a year or two, sometime these guys work out. Jay would depend on if he could recover his stuff, if not he is a lost cause or just a LOOGY. Davis and Lujan I do not know enough about or have a feel for if they would be taken.Would not suprise me either way and the Twins should have enough open slots to add 5 - 6 players, but some may well be left vacant for free agent signings. This is what will make this offseason so interesting. Rooker will probably be better than Weil so would not add him. Wade will be added, but hope he will be traded, how many outfielders do we need, and do not rate him likely to make the club next year. Arraez is the only position player who stands any chance of being protected. I don't really think the Twins would worry that someone is going to take Zander Wiel and keep him on the big league roster all year. I don't know enough about the pitchers to comment. Suffice it to say, if the Twins didn't think enough of the close ones to give them a look in September, it's really unlikely they'll be protected. Some of the bigger arms or ones that are just coming back from injury (like Jay) have a chance. I always think that this type of article makes little sense without listing the current 40-man roster so that we can get an idea of how many spots there might be. For this particular year, though, I think there are going to be a lot of changes and new additions from outside the organization. This gets discussed on and off. The short answer is no, nothing can be done, for now. Not an exciting group demanding to be added.Kind of goes hand and hand with the strength of the organization in the lower levels from Fort Myers and down. I wouldn't have Wade as a given, Seth.Like Gordon, he sure didn't hit well at AAA.Whereas, I would add Arraez who has been amongst the leaders (batting average) at every level. I mentioned in another article the other day that there were a dozen pitchers on the 40-man who I considered marginal.That didn't include Santana and Belisle, who I assume will both be gone in a few days.Remain hopeful that at least half of that dozen are either released, outrighted to Rochester, or traded to open spots for the Rule 5 adds and a few free agent signings. I wonder if Tyler Jay would even be up for consideration if he hadn't have been a firstround draft pick a few yearsback. Doesn't seem like he's earned his way onto the 40-man roster otherwise. Did we resolve that Roster Resource is wrong and that Graterol and Alcala are not Rule 5 eligible. Not a lot of room to add the fringy bubble players when there's already several bubble players on the 40. Are any of these relievers better than Busenitz, Curtiss, and Duffey? I'd go the opposite route.I don't know how many open spots there are on the 40 man, but I seem to remember discussions that there could easily be around 8 or so.I'd look at some other teams that have a 40 man bind, and relieve them of some of the guys on their bubble. (Assuming I remembered correctly about the Twins having lots of spots once Belisle, Gimenez, etc are released). Keep in mind, though, that you'll probably want some room to add quality free agents. Having a full 40-man means doing something later on to make room. Losing a player is a lot bigger risk when you try to remove him via waivers (just there for the taking, by any team with room on their own 40-man), versus risking the Rule 5 (where a team has to keep the player on their 25-man all season). Gordon is a given. I am not so sure about anyone else. I would think Wade will likely be protected as well. After that it really comes down to upside, need and intangibles. I could see any of Quesada, Cutura, Navarretto, Wiel, Stashak, and Rameriez being added. Arraez and Jay are special cases. If Jay has lost his velocity as rumored, he probably doesn't get protected. I think Arraez gets protected only if they think he can add power. Singles hitters without speed and no real position aren't very valuable. 300 hitters with even moderate power, are going to have a place in the majors. Arraez can flat out hit, I believe he is average to average plus on defense.Major leagues can always use players like that.I would like to give him a chance. The Twins should have 5 roster spots. givens are Anderson and Reed and Gordon. I would also consider Arraez. After that you add by subtraction. Is Wade better than Grossman as an example. No one else stands out as being an exceptional add that probably won’t be passed by someone in the system that doesn’t need roster protection. The greater loss to the Twins could be in the minor league portion of the draft but again the two they might lose isn’t earth shattering. The odd guy is Quezada. Could he be a Santana-like pick that could blossom as a backend keeper for a rebuilding team looking at a guy to contribute three years out? The Twins gave to make decisions on the starting depth. And they will have names like Granite and Slegers and Dejong not to mention Duffey or Busenitz that could be removed for free agents or signing other “better” 40-man guys released by other teams. The other question is who besides Bard and Baxendale will walk as free agents. Is Navaretto a minor league free agent? If so that may be the only reason to add him if you can’t resign him to a minor league contract. The greater loss to the Twins could be in the minor league portion of the draft but again the two they might lose isn’t earth shattering. They get to protect additional players when the minor league phase begins, so I'm not worried about losing anyone promising. Thanks for the timely article, Seth. As others have said, there's a logjam for the 40-man. The FO is going to need to make some good decisions, especially with pitchers. OF - Assume Wade is protected. Field and Granite are the same age and both on the 40-man roster. Do the Twins drop one of them? I'd lean towards keeping Granite. Wiel and Arraez. I'm not sure they would be taken in the Rule V, but I'd hate to lose either of them. Both players manage the K zone and hit the ball. Sometimes, it's easier to teach power than to unlearn a grooved swing (like Austin). I'd like to hear opinions from those who have seen these two play in the past year. PS - For Wiel, HR power. For Arraez, more extra base hits. It looks like they currently sit at 39 on the 40-man. Assuming Gordon and Wade are givens, and adding Reed and Anderson to that list, they'd need to clear up 3 spots. That would put them at 37 - assuming the 4 are added. Once other team's castoffs and FAs start rolling in, you've got Magill, Drake, and De Jong that aren't likely to be missed. Also wouldn't be opposed to trading Reed and/or Odo if anyone came calling on them (but they probably won't). The unfortunate reality is that guys like Busenitz, Duffey, Curtiss, Reed, Jay, Anderson, Bard, etc. are kind of a dime a dozen.The hope has been for 2-3 or more of those relievers to develop into guys they couldn't afford to lose.To my untrained eye, that hasn't happened.The list used to include Chargois, who was with the Dodgers for a bit but really has never developed into that lock down reliever. Still hope that the Twins try to get an ace through a trade, and a few of the prospects are gone. BTW, Brusdal Graterol was signed on August 29th of 2014 and the MiLB season ended on September 1st that year, so he is Rule 5 eligible and a no-brainer to be added. Don't forget adding Mejia, Castro, and Pineda off the 60 day DL. So they'll be at 40 already when they add them back. I don't think Reed gets added, they've already shown their hand with him. I wouldn't worry about Jay and so far I haven't seen the new front office overly attached to the previous front office's big ticket draft picks. I could see Nick Anderson added but he's a bit long in the tooth. I might actually predict that Cody Stashak is the most likely reliever to be added. It looks like they've started grooming him to be a multi inning reliever and he's starting to build some good momentum. According to bbref, adding those 3 puts them at 41. The term “championship season” shall refer to the full schedule of regular-season games that has been approved for a Major or Minor League Club in accordance with the provisions of Rule 32. The above excerpts are taken from THE OFFICIAL PROFESSIONAL BASEBALL RULES BOOK. I don't know which team he was assigned to, but in 2014 the DSL finished its regular season around August 21. So for Rule 5 purposes I take this to mean he counts as a 2015 signing, and thus he has one more year. Reed is better than 2 of them. It''s a reality. That is and should be a factor for all teams. But, as we saw last year with Stewart, it isn't the biggest factor. A bigger factor will be his stuff. Second, they have Taylor Rogers and Gabriel Moya in the big leagues and Andrew Vasquez has passed Jay as a LH RP option. They also will factor in if they plan to go get a LH RP in free agency, and also, how they could potentially uses these guys. But the GCL and DSL seasons were over, so he's not eligible... at least that's what I've been told by a few people. If that is wrong, then he is #1 on the Given list. For sure.